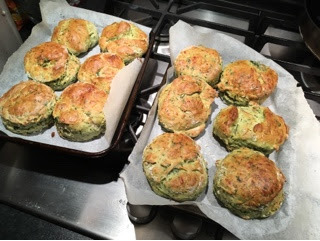 I had some leftover artichokes and spinach from meals last week and I came across these scones and thought they'd be a fab way of using up my leftovers. They are delicious and a great accompaniment to soup. Put the spinach in a colander and pour over a kettle of boiling water. Leave to cool, then squeeze out the excess water and chop. In a large bowl, whisk together the flour, baking powder, baking soda, salt, and garlic powder. Using your fingertips, rub the butter into the flour until it looks like breadcrumbs. Add the cheese, artichokes and spinach, stirring to combine. In a separate bowl, whisk together the milk and egg. Stir the milk mixture into the dry ingredients, you might not need all of it, so add gradually. Place dough on a floured surface and form into a disk, 3/4 to 1-inch in thickness. Cut out into circles with a cutter. Place the scones onto a lightly greased or lined baking sheet. Brush the top of each scone with the leftover milk and egg mixture or just egg. Put into the oven and bake for 15-20 mins or until golden brown. Leave to cool.